John is the lead pastor of Grace Church Philly, and will be working with us over the coming months as our interim pastor. John’s ministry is intentionally gospel-centered, seeking to make the good news of salvation through Jesus Christ the core of our message and our lives. 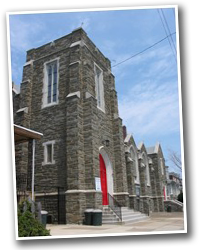 You can email Pastor John at johndavis@gracechurchphilly.org. Walt is the primary lay leader of the church, elected to preside at business meetings, and facilitate the work of the boards. He and his wife Cindy teach the new members class and serve on the worship team (piano and trumpet). Walt is also the treasurer of the church. You can email Walt at waltsr@gmail.com. Walt Jr. heads the Board of Deacons, tasked with assisting the pastor in the spiritual oversight of the church, and serving the church in various ways. Walt leads worship most Sundays, and also works with the youth group. You can email Walt at WaltRiceJr@gmail.com. Debby has been working with kids her whole life, taking on the role of teaching our children from her mother before her. Debby (seen here with her husband Bob) leads our Sunday and Wednesday kids classes, as well as our annual Vacation Bible School extravaganza. You can email Debby at debrac1487@aol.com. Moderator and Treasurer: Walt Rice, Sr.